A Bachelor of Arts, specialized in New Media. Currently upgrading towards a Master of New Media. My interest in the field of new media lies in the subject of space, and how new media can shape these different spaces. My Bachelor thesis named; "Augmented space and Digital Art, or a remediation of virtual reality" concentrated on the subject of space in relation to Digital Art. Apart from new media I have a major interest in popular culture and modern art. Although the homepage of Wikipedia invites one to participate in the growth process of Wikipedia, this notion is being prevented by different thresholds. For instance there is the threshold of the technical; as easy as it is to click the edit tab, it is not as easy to conform to the Wikipedia code. In order to create a nice looking post on Wikipedia one needs to practice with a variety of code and conformations. This threshold is perhaps created to filter out those have not enough knowledge of the medium but might have sufficient knowledge about the subject they write about. This in order to keep the cultural elitism at a high. In encountering a Wikipedia post, one hardly notices the time and effort is placed in such a post. Often the post has been through revision after revision, and many different eyes have taken a look at the post. And all these eyes have a different notion about what information or posts are encyclopedia worthy and what is not. For this research I would like to focus upon the so called remove list of Wikipedia. This list holds all the entries which are under debate. This debate is in my opinion interesting because most objectifications are in stride with the Wikipedia ideology.Since no one can be author, wherein then lies the authenticity? Although there are no authors, how about then the powerful status of a moderator? Is submitting an entry into Wikipedia all dependable of coming to terms with the most forgiving moderator? As I mentioned earlier, in researching these behavioral and cultural problems of users I would like to focus upon the remove list. Hereby I would like to show the trend in deleted or disputed Wikipedia entries. This in order to form a pattern in subject matter, that being the question of what is fit for an encyclopedia and what is not. Since everybody has a say about the content and there is little to some law in effect to apply the rules of Wikipedia. I hope to find out how this interplay of author versus author hold stands. Looking at the problem of everybody is an author, a few things need to be further defined. In order to establish such a large object of research a definition needs to be made. In researching the removal list, it is best to look at a small period in time. Such a period as a week perhaps two weeks at most. Then on a day to day basis one can etsablish the deleted items. Once the deleted items have been established one can start looking at what these items have in common. What is their content? What is the reason why these items have been deleted? And what are the arguments to keep these items in existence? Hereafter one can look at the debate of taste, what items can be classified as being Wikipedia worthy? Since an encyclopedia can be seen as a branch of knowledge, what then is there to be qualified as being knowledge? In my opinion this always remains a judgment of value. 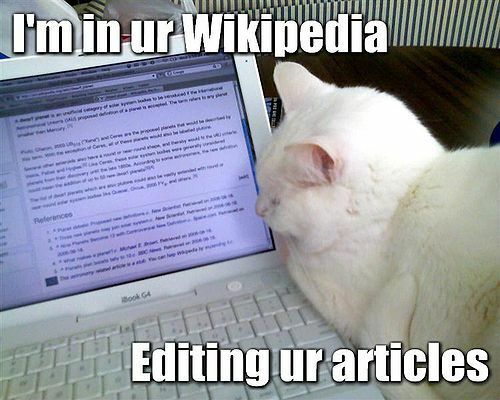 « Is Wikipedia too Encyclopedic?